I'm sure you've heard of slope intercept form before, but do you actually know what it means? GradeA will give you a trick to help you remember this easy formula because we will teach you to truly understand it. The first thing you need to understand is that it is simply an equation that represents a straight line. Because lines can go in any direction, the numbers in the equation are used to tell you what direction the line should go. The little tricks will be especially helpful when you have to graph a line with the slope intercept form. You will plot the "beginning" point first on the graph, and then you will move the right number of places to make the "move." Simply connect the dots and you have graphed your line! Hopefully now you truly understand this form of a line represents. We told you it was going to be easy! Great job! 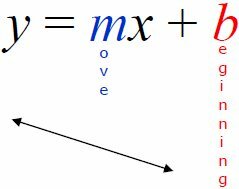 These two concepts are crucial in any algebra class - and they are used in geometry, algebra II, and all the way up through calculus as well. It's important you build a strong foundation for these topics early in your math careers. GradeA can help you through understanding slope or how to calculate it. We also have a full explanation of the y-intercept in case you aren't completely sure what that is either. Of course, you can also view our complete list of free algebra help topics.